Ukraine customers new project 130T Yarn Tube Paper Making Project, ordered Leizhan complete paper pulping line, which include D Type Hydrapulper continuous pulping system, Mid Density Cleaner to remove impurities, coarse screening, fine screening, fine grinding pulp, and pulp inflow system, etc. 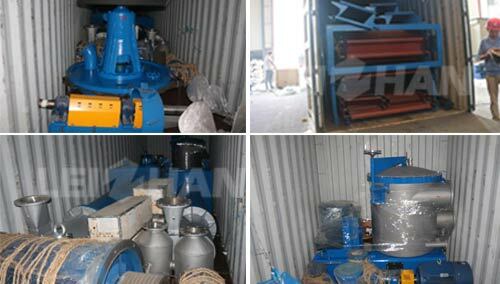 BFW1400Chain Conveyor, ZDSD26 D Type Hydrapulper, CZJ1200 Sediment Well, ZSF1 Hydrapurger, ZST1A Drum Screen, ZD0.05 Grapple, ZTS1 Ragger, QSJ-2 Rope Cutter, ZSC5 High Density Cleaner, Inclined Screen, ZNS1.2Mid Consistency Pressure Screen, PZ2 Reject Separator, ZSC6 Mid Density Cleaner, ZNS1.5 Mid Pressure Screen for fine screening, ZDP450 Double Disc Refiner, JB850 Pulp Agitator, NLS1.5Inflow Pressure Screen, Fan Pumps, White Water Pumps, etc. Leizhan can supply the complete set of kraft/corrugated/tissue/cultural/coated/yarn tube paper making line for paper mill, welcome to consult us for more details: leizhanchina@gmail.com.